The rising Chinese star Wei Yi is playing a 4-game classical match against the Czech № 1 David Navara in Yancheng, China from 31th of December 2017 till 3rd of January 2018. The winner gets $20,000, the loser $10,000. The time control is 90 minutes for 40 moves then 30 minutes to the end of the game, with a 30-second increment from move 1. If the match is drawn the players play two 5+3 playoff games and potentially one 6 vs. 5 Armageddon game. Wei Yi won the "Hengda Cup" ater a playoff. Watch the games of the Wei Yi - Navara 2017 with computer analysis LIVE on ChessBomb. The 1st ALAIN Juniors Championship U20 is a 9-round Swiss tournament taking place from December 30, 2017 to January 5, 2018 in Dubai, United Arab Emirates. Watch the games of the ALAIN Juniors Championship 2017 with computer analysis LIVE on ChessBomb. The Hastings Masters 2017/2018 is a 9-round Swiss open taking place from December 28, 2017 to January 5, 2018 in Hastings, England. Time cotrol: the players receive 100 minutes for the first 40 moves followed by 30 minutes for the rest of the game, plus a 30-second increment starting from move one. Watch the games of the Hastings Masters 2017 with computer analysis LIVE on ChessBomb. The World Rapid and Blitz Chess Championships are a tournaments held by FIDE to determine the World Champion in chess since 2012. The 2017 King Salman FIDE World Blitz Championship is a 15-round Swiss open taking place in the Apex Convention Centre in the Saudi Arabian capital of Riyadh from 29-30 December. The time control is 3 minutes per player for all moves, with a 2-second increment per move from move 1. No playoffs will be held if players end on the same number of points, with monetary prizes shared equally. Watch the games of the World Blitz Championship 2017 and Women World Blitz Championship 2017 with computer analysis LIVE on ChessBomb. Intercollegiate tournament format is a 4-player team with up to 2 alternates. Open to university, college, community college, and technical college teams from North and South America and the Caribbean. Teams must supply a letter from their universities stating that the players meet eligibility requirements. Watch the games of the Pan-Am Intercollegiate Championships 2017 with computer analysis LIVE on ChessBomb. The German Team Club Championship U12, U14 (boys and girls), U16, U20 (boys and girls) and is a 7-round Swiss team tournament taking place from 27-30 December 2017 in the Youth Hostel in Verden/Aller. Watch the games of the German Team Club Championship 2017 with computer analysis LIVE on ChessBomb. The 47th Rilton Cup takes place from December 27th till January 5th in Stockholm, Sweden. The 9-round Swiss open will feature nearly 300 players from several countries and a 1st prize of 20,000 Swedish Kroner (about €2,000). The event is named after Dr. Tore Rilton, who died in 1983, and wanted the tournament to be an opportunity for young Swedish talents to challenge strong masters from abroad. This year's edition includes 75 players with FIDE titles. Watch the games of the Rilton Cup 2017 with computer analysis LIVE on ChessBomb. The Lorca Open is a 9-round Swiss tournament taking place from 26th till 30th of December 2017 in Lorca, Spain. Watch the games of the Lorca Open 2017 with computer analysis LIVE on ChessBomb. The 2017 King Salman FIDE World Rapid Championship is a 15-round Swiss open taking place in the Apex Convention Centre in the Saudi Arabian capital of Riyadh from 26-28 December. The prize fund is $750,000, with $250,000 for 1st place. The time control is 15 minutes per player for all moves, with a 10-second increment from move 1. No playoffs will be held if players end on the same number of points, with monetary prizes shared equally. The 2017 world rapid champion is the Indian grandmaster Vishwanathan Anand. The winner in the women's section is Nana Dzagnidze. Congratulations! Watch the games of the World Rapid Championship 2017 and Women World Rapid Championship 2017 with computer analysis LIVE on ChessBomb. Watch the games of the UAE President CUP 2017 with computer analysis LIVE on ChessBomb. The Kiev Chess Federation organizes the "Match of the Stars" in Kiev from December 24 to 28 2017. 4 of the games are in the classic chess and 2 of the games are in rapid chess. The match will be attended by Kirill Shevchenko (2547), Alexander Beliavsky (2542), Iulija Osmak (2355) and Laura Unuk (2334). Schedule: The games start at 13-00 every day (time zone UTC +2). Watch the games of the Match of the Stars 2017 with computer analysis LIVE on ChessBomb. Watch the games of the Cup of Kazakhstan 2017 with computer analysis LIVE on ChessBomb. The Groningen Chess Festival is taking place at Groningen University in the Netherlands from 22-30 December 2017. The A Group is a 9-round Swiss Open with a €6,000 prize fund. The time control is 90 minutes for 40 moves then 30 minutes until the end of the game, with a 30-second increment from move 1. Watch the games of the Groningen Chess Festival 2017 with computer analysis LIVE on ChessBomb. Bhopal International GM Chess Tournament-2017 is held from 21st to 28th of December 2017 in Bhopal, Madhya Pradesh, India. System of play: FIDE Swiss system with 10 rounds. Time control: 90 minutes + 30 sec. increment. starting from the first move. Watch the games of the Bhopal International GM Tournament 2017 with computer analysis LIVE on ChessBomb. 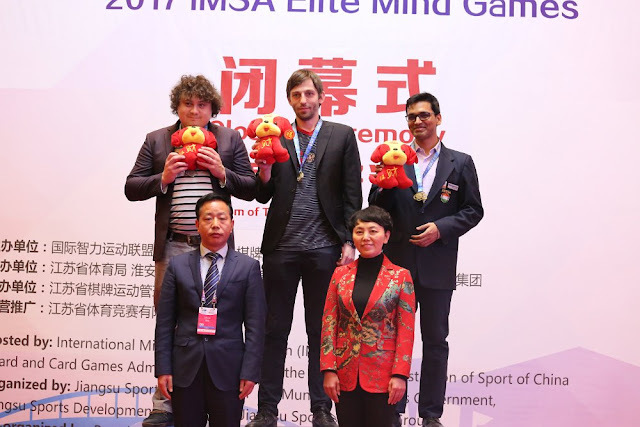 The 2017 IEMG Chess Games Basque were held in China, Huayane, on 15th and 16th of December 2017. The Basque section was a 5-round Swiss in which players plaied two games against an opponent simultaneously (one with White, one with Black), with a time control of 20 minutes for all moves and a 10-second increment from move 1. The prize fund was €50,000, with €11,000 for 1st place. In the men group Alexander Grischuk won the decisive battle with Wang Hao. Anton Korobov took the silver medal while Pentala Harikrishna, Yu Yangyi and Dmitry Andreikin shared 3rd place. Pentala Harikrishna won the bronze medal on tie-break. Shakhriyar Mamedyarov and Wang Hao shared 6th place. Watch back at the Mind Games Basque 2017 on ChessBomb. In the Women's group Zhao Xue won 7.5 points out of 10 and took the gold medal defeating Mariya Muzychuk. Anna Muzychuk took the second place with 6.5 points, Katerina Lagno and Harika Dronavalli shared the third place but Lagno took the bronze medal thanks to better tie-break. The winner among women is Zhao Xue. Watch back at the Women Mind Games Basque 2017 on ChessBomb. The 2017 European Individual Rapid Championship is taking place from 16-17 December in Katowice, Poland. The Swiss tournament consists of 11 rounds and features over 1,000 players. The prize fund is €21,000, with €4,000 for 1st place. Time control: the players have 15 minutes for all moves, with a 10-second increment starting from move 1. The Winner of The European Rapid Chess Championship 2017 is Maksim Vavulin! Silver medal goes to Jan Krzysztof Duda and bronze for Pavel Ponkratov! Congratulations! Watch the Closing Ceremony of the European Blitz and Rapid Chess Championship 2017. Watch the games of the European Rapid Championship 2017 with computer analysis LIVE on ChessBomb. The Paraguayan Championship (Torneo de Maestros - Campeonato Paraguayo Absoluto 2017) is a 10-player round-robin tournament taking place from 15-22 December 2017 in Asuncion, Paraguay. GM Bachmann Axel won the Paraguayan Championship. Congratulations! Watch the games of the Paraguayan Championship 2017 with computer analysis LIVE on ChessBomb.